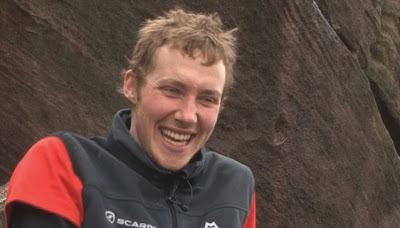 Congratulation to James Pearson who claimed the second ascent of Gerty Berwick (E9), or as I like to call it “Gerty Berty”. I had been calling it Twlons for the last year since I first filmed James working the line. (TWLONS – The Wall Left Of New Statesman). It was a very cold windy day in February last year, the day after James had lead The Groove. We called by Ilkley and James worked the moves on a shunt. I hung on a rope and got blown around by a freezing wind whilst I tested out some camera angles. It was a rather grey overcast day, but luckily James brightens the shot up by wearing a black top and grey pants! Maybe some of the hardest moves on a grit route? 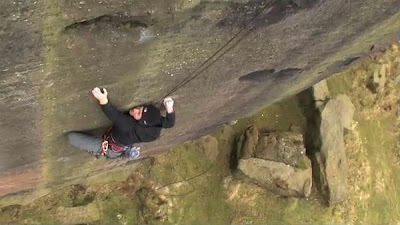 I've just added a movie of Ben Cossey climbing Simba's Pride to the Hot Aches website as our clip of the month. This clip is taken from our DVD Committed Vol I.